Your Cosmetic Dentist in Oklahoma City Can Boost Your Confidence! Whoever thought that making a first impression could be so daunting? There are many times in life where the first impression we make can make a huge difference in our future relationship with that person. Whether you have a very important job interview lined up or your significant other is introducing you to their parents, having a brighter smile can do wonders for your self-confidence. However, a smile doesn’t just make you feel good; it can also have an everlasting effect on the people around you. Studies have shown those who smile often tend to be better in social situations. Here’s how your cosmetic dentist in Oklahoma City can help! If you’re looking for a minor touch-up to your current smile, you’ll find many benefits from one of the most popular cosmetic treatments out there. Whether it’s in-office or at home, professional grade teeth whitening can make your smile up to 8 shades whiter in a single one-hour visit or in one to two weeks with take-home whitening. Being able to flash a white smile at your next job interview could mean the difference between landing your dream job or continuing the job hunt. In fact, studies have shown that people who smile more are often seen as more credible. When you’re smile is as professional as your treatment, you can’t go wrong with teeth-whitening. As a bonus, Lumineers are specifically designed to remove as little enamel as possible prior to placement, so you can’t keep more of your enamel and still get a brighter smile. 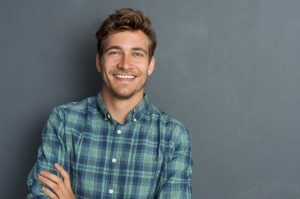 With a more uniform smile, you’ll feel confident having your picture taken at your next company event or wedding, especially if you’re the lucky man or lady who’s getting married. Don’t worry, meeting their parents will be a breeze once they see you brand-new smile. Do you want to have straighter teeth by this time next year? Looking to improve bite issues you’ve had previously? Your cosmetic dentist in Oklahoma offers Invisalign clear braces to make your orthodontic treatment easier. By wearing Invisalign’s clear aligners over the course of 12 to 18 months, you can fix misalignments in your smile without the long-term use of metal hardware. If you’re looking to keep a professional image or have a metal-free smile in future photos, Invisalign can make it happen! People who smile often are generally seen as more attractive, so it’s worth it if you’re already going to have a healthier smile by the end of treatment. Plus, clear aligners won’t get in the way of future photos of yourself and are easily removable if needed. Looking for another cosmetic treatment? Your dentist in Oklahoma would love to hear from you! Schedule an appointment with them today! Dr. Joe Isaacson is an award-winning dentist who earned his undergraduate degree from Oklahoma State University and his dental degree at the University of Oklahoma College of Dentistry. He’s also a member of the Academy of Cosmetic Dentistry. To learn more about his cosmetic treatments and practice, contact him at (405) 943-8575 or visit his website.